We had arrived in Hiroshima traveling from Tokyo and Osaka on bullet trains through a hot haze obscuring the landscape. During the last leg of our journey, I read in the Japan Times that at least 60 Japanese were dead because of this heat wave. 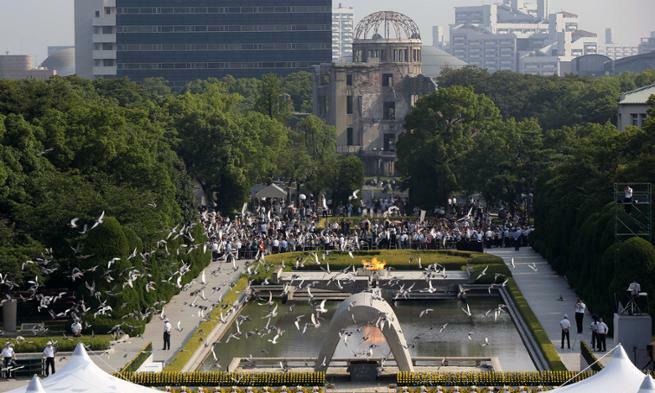 Doves fly over the cenotaph dedicated to the victims of the atomic bombing at the Hiroshima Peace Memorial Park. Despite such oppressive weather, and with the cicadas buzzing loudly, the citizens of Hiroshima are preparing for the 70th anniversary of when the first atomic bomb burst 2,000 feet above the heads of their parents and grandparents. Held on Aug. 6 every year since 1947, the Hiroshima Peace Memorial Ceremony draws tens of thousands from around the globe to hear speeches and the ringing of the Peace Bell at 8:15 a.m., exactly when the bomb exploded in mid-air on Aug. 6, 1945. I am in attendance because students from universities on nearly every continent — including ones from Madison — travel to Hiroshima for a conference held by the International Network of Universities, of which JMU is a founding member and current president. 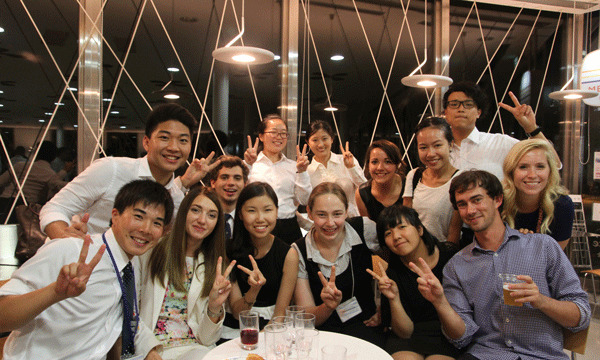 The INU Global Citizenship and Peace Conference, now in its 10th year, begins annually with students attending the Aug. 6 Peace Memorial Ceremony at Ground Zero in Hiroshima. I’d been told that beginning the conference at this solemn event creates a powerful impact on the students’ experience. What I didn’t anticipate is how surprising the experience would be for me, too. 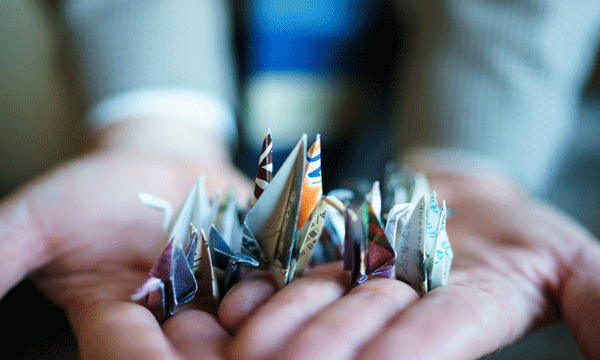 The author holds a handful of origami cranes, a gift from a Japanese woman. "She embraced me and said, 'Thank you for coming, American.'" This year the outdoor ceremony is on a Thursday. Recorded public address announcements alternating between Japanese and English remind everyone at the Peace Memorial Park to keep hydrated. Attendees searching for seats turn their faces up toward mist machines as they seek relief from the torrid heat. Using complementary cardboard fans emblazoned with bullet train advertisements, they rapidly fan themselves. It is only 7:30 in the morning. As the ceremony begins and the crowd settles in, the throbbing buzz of cicadas grows from background noise to become almost a distraction. Among several speakers, Japanese Prime Minister Shinzo Abe delivers remarks and sits back down beside Caroline Kennedy, American ambassador to Japan. The crowd suddenly quiets and grows somber as two children prepare to ring the large Peace Bell. All heads bow at the first low sonorous toll. Our sun is 92 million miles from Earth. Yet on this sweltering August day, it is hot enough to literally burn our skin. And with the large bell reverberating loudly over and over, standing at Ground Zero exactly 70 years to the moment after the bomb utterly changed our world, it is shockingly vivid to imagine the horror of another searing sun bursting unexpectedly overhead, vaporizing us all. His hopeful perspective is not unusual for the students attending the conference. In fact, even while reflecting on the horrifying effects of the atomic bomb explosion, most of the students express optimism. Maybe it is the gracefulness with which the Japanese moved from devastation to working toward reconciliation that inspired them. Among the 80 conference attendees are four JMU students. At the opening reception held the evening before the ceremony at Ground Zero, students and faculty from INU universities around the world met for the first time in a big room at Hiroshima University. They discovered by particular markings on their name badges which country groups they were assigned to for a simulation of international negotiations during the conference. The reception began somewhat stiffly, with participants finding their fellow group members and struggling to identify a common language. But the spirit among the students was strong. And after stumbling over name pronunciations and botched handshakes, exuberance in the room grew to almost giddy levels. Conference attendees enjoy getting acquainted. And while experiencing how other cultures around the world see things quite differently can enlighten, realizing that we also share human similarities with people who speak, look and live nothing like we do also can edify. Like our cabbie, the sound of cicadas reminds me of summertime, too.